Living without your teeth is no fun. It leaves you unable to eat the foods that you normally would, can make speaking clearly a challenge and greatly impacts your confidence. Thankfully, there’s a sure method of restoration available to you – implant dentures in West Monroe. 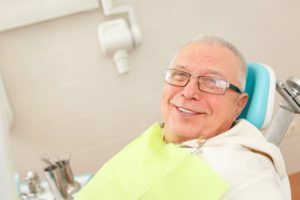 As you read on, you’ll learn how this procedure reverses all the inconveniences that your missing teeth have caused and can enhance your oral health. Dental implants are surgically inserted titanium posts that are affixed to the underlying bone and serve as replacements for your missing teeth roots. The posts are able to fuse with your existing bone through a process called osseointegration, which provides for a very solid foundation. After your implants are placed and you’ve had sufficient time to heal, an abutment is anchored to it, which allows for either a crown, bridge or implant-retained dentures to be attached. The latter replaces a full arch of missing teeth. There are huge differences between traditional and implant-retained dentures. The former uses a gum resin base that supports teeth made from porcelain. The fixture then rests on your gums and attempts to restore your normal function. One of the problems that people experience with this method is that it doesn’t provide much support for the jawbone, which is critical to oral health. That’s because the latter regulates the production of new bone cells using a healthy distribution of tension. If there is insufficient tension provided from a root or implant attaching to the underlying bone, then there is limited-to-no new bone cell production, which results in bone degeneration, facial collapse and premature wrinkling. Implant-retained dentures, however, provide the needed support for healthy bone production. Thus, the above discussed problems are reversed. Furthermore, you won’t have to worry about this type of application getting loose and slipping, because they attach to your implants using abutments as anchors. Maintain Moisture – Don’t let your dentures dry out. When you remove them, be sure to soak them in a denture cleaning solution or plain water. Brushing – Be sure to brush your dentures daily to remove leftover food particles and dental plaque. Care for Your Mouth – Bacteria can accumulate on your dentures and in your mouth, so it’s important to clean both thoroughly. Before inserting your dentures in the morning, take the time to brush your gums, tongue and palate. This helps to create and maintain a healthy environment. Visit Your Dentist – You can never go wrong with maintaining regular visits to your dentist for cleanings and checkups. While there, the professional will be able to assess the condition of your oral health, implants and prosthetics. Now that you’re more informed about one of the best options available to restore your smile, the next step is to reach out to your dentist to schedule a consultation and learn more about the process. Soon, you’ll be able to return to the way of life you’ve sorely missed! Dr. L. King Scott earned his dental degree from Louisiana State University School of Dentistry. Over his nearly 40-year career, he has been consistent in his pursuit of more knowledge about the ever-evolving field of dentistry. Thus, he’s taken thousands of continued education courses, which includes advanced training from the Zimmer Institute in “All on 4” dental implant systems. To get the full restoration you desire and need, you can contact Dr. Scott through his website.